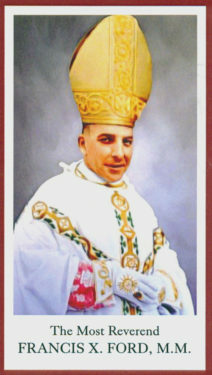 Bishop Francis Xavier Ford, M.M. The public phase in the process to make Brooklyn-born Bishop Francis X. Ford a saint has begun. Bishop Nicholas DiMarzio formally announced the opening of the cause at a Mass celebrating the 100th anniversary of the priestly ordination of Bishop Ford. 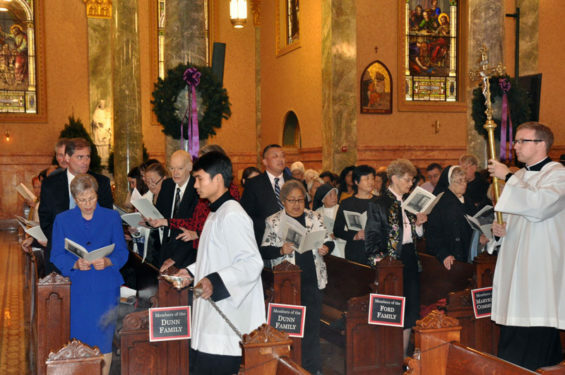 The bishop was the main celebrant as more than 600 people gathered Dec. 3 at St. Joseph’s Co-Cathedral, Prospect Heights, the home parish of Bishop Ford before he joined the Maryknoll Foreign Mission Society. 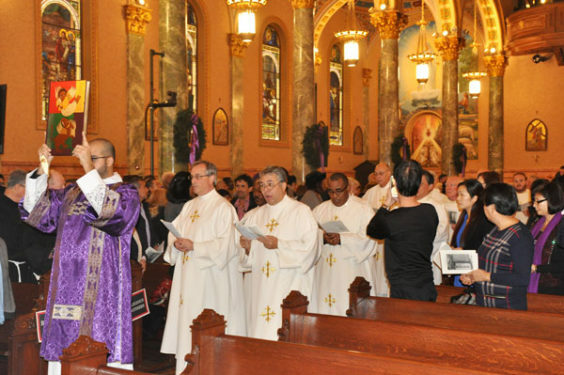 Bishop Ford has celebrated his first solemn High Mass in 1917 at St. Joseph’s Church, but not the current parish church. 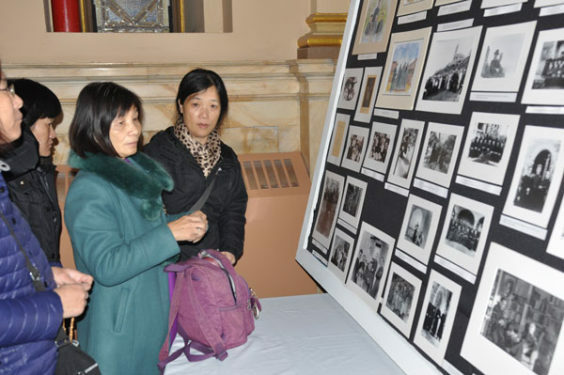 Only months later, he was among the first group of Maryknoll missionaries to leave for China. 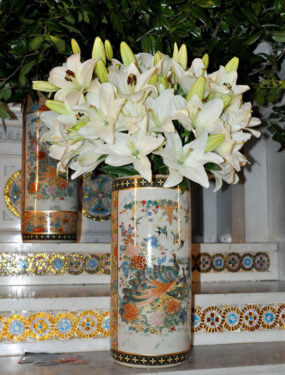 In 1952, he died as a martyr in a Communist Chinese prison camp. 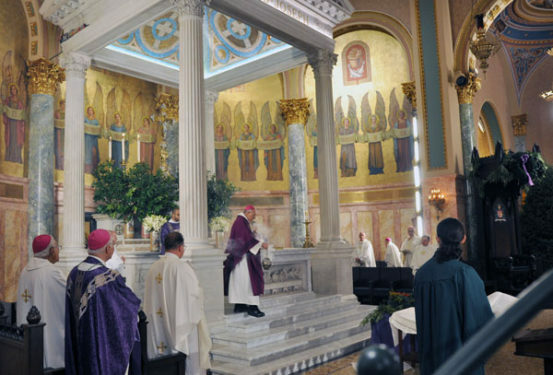 “As we begin this process of prayer for the canonization of Bishop Ford, we recognize his holiness,” said Father Kevin Hanlon, M.M., homilist at the Mass. 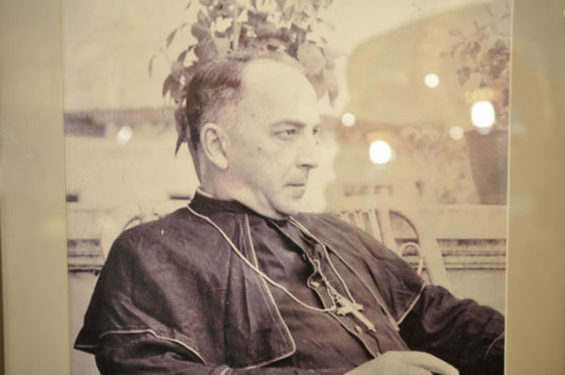 Father Hanlon, who said his own vocation was inspired by the story of Bishop Ford, served 17 years as a missionary in Japan. A prayer book on display at the Mass lists 432 Carlton Ave. in Brooklyn as his home address, walking distance to St. Joseph’s Academy where he attended elementary school. 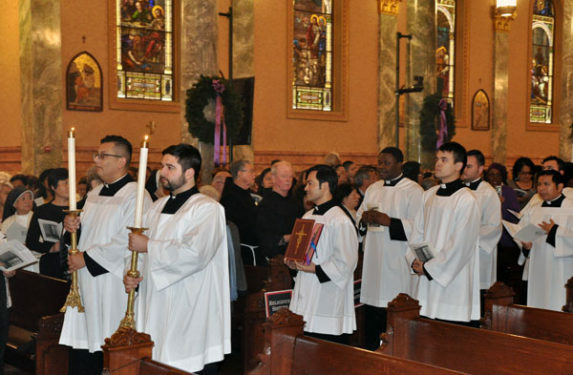 At St. Joseph’s Seminary, Dunwoodie, “he fit in well, although he was a little more studious, prayerful and spiritual than the rest,” said Father Hanlon. On the grounds of Maryknoll, the homilist said, the young Ford was known to retreat to the wooded areas for contemplation. 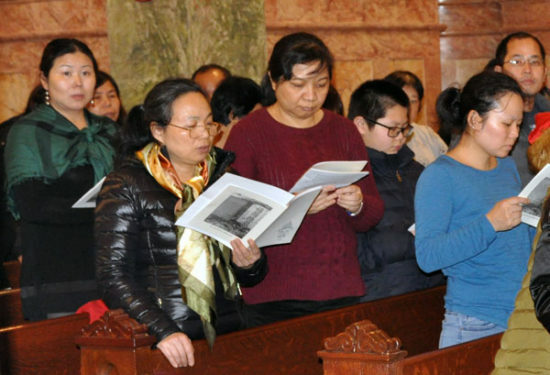 The homilist said that Father Ford’s missionary approach in China was revolutionary because he sought to “make the Church as Chinese as possible,” rather than attempt to impose a Western-style spirituality on the people. 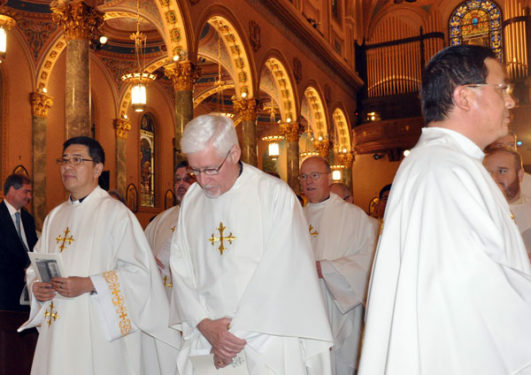 He would say that “Our Lord was never condescending and we should never consider our culture better than any other,” according to Father Hanlon. 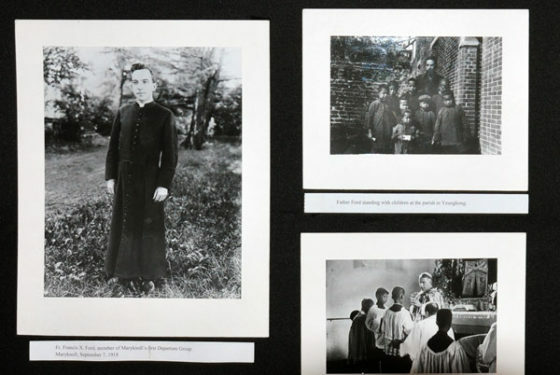 The homilist explained that for Bishop Ford, missionary work was primarily spiritual and not simply meant to provide social services, although the Maryknoll missions did contain health clinics and schools. “He would say we didn’t come here to tidy up this little corner of the world. 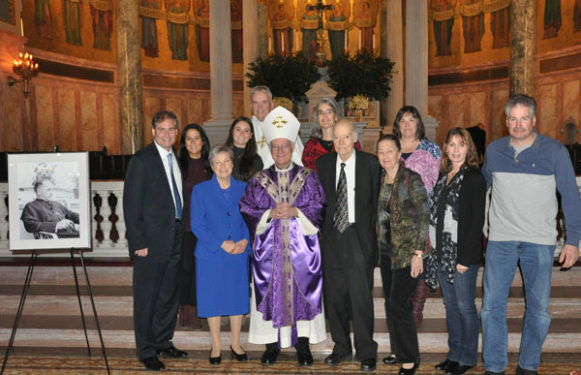 We are one with the people so that we can show them Christ,” Father Hanlon said. 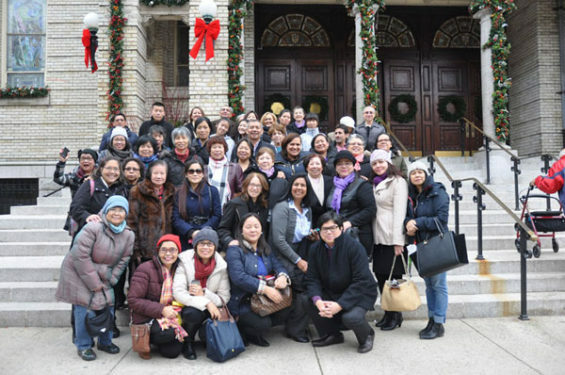 In his 20 years as Bishop of Kaying, his flock grew from 9,000 to more than 20,000 Catholics. 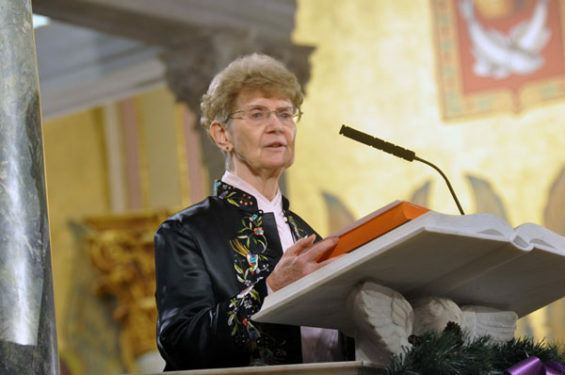 “After a change in government, the Church began to be viewed with suspicion,” said Father Hanlon. Eventually, the Communist revolutionary takeover found Bishop Ford guilty of trumped up espionage charges and marched him through the streets as a form of public humiliation. He died in the prison camp at Canton on Feb. 15, 1952. 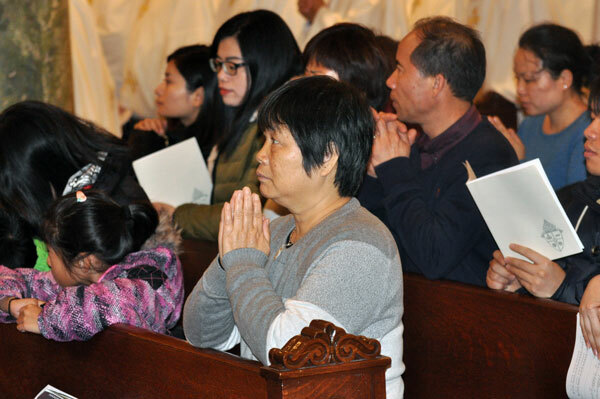 “One who sought to be one with them was mistaken by the Chinese government to be an oppressor,” concluded Father Hanlon. “The only kingdom he represented was the kingdom of God. 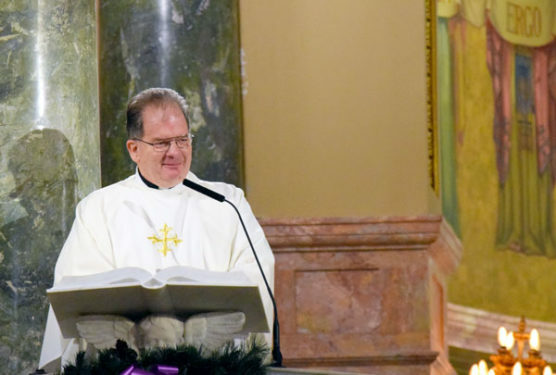 Father Hanlon recommended that young people look to the example of Bishop Ford – to realize that he was someone just like them, and that they are capable of doing work similar to his. Present in the congregation were members of the Dunn and Sheridan families, who were related to Bishop Ford on his maternal side. Some travelled from Vermont and New Hampshire to be present. 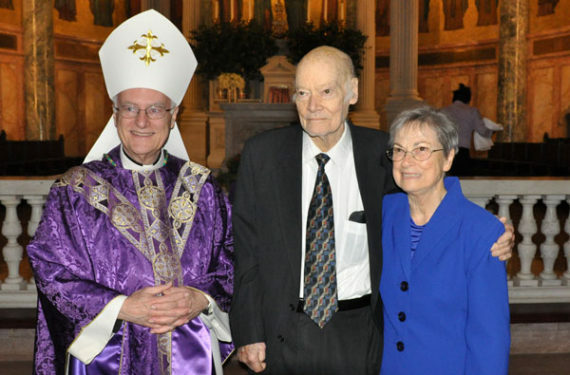 Loretta Dunn, a cousin, said she recalled as a 12-year-old seeing Bishop Ford in 1946 at her family’s home at 462 Eighth St. in Park Slope. She said the family has become increasingly concerned because of the internal strife in China. They were hoping Maryknoll would offer him a position at headquarters in upstate New York. 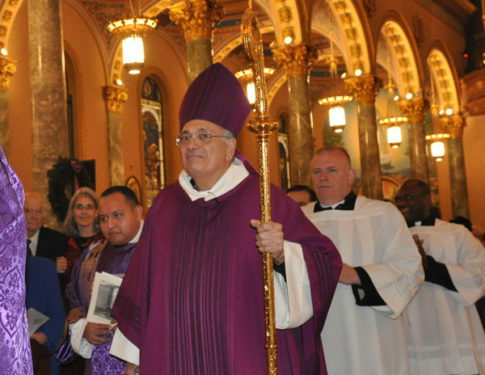 “Unless we pray and receive miracles, we cannot go forward,” said Bishop DiMarzio. 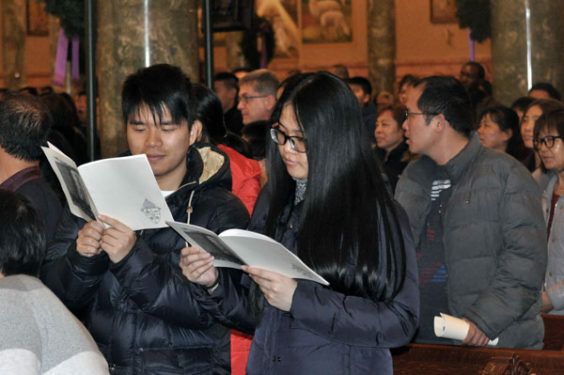 He announced that Auxiliary Bishop Raymond Chappetto will be the episcopal liaison to the cause, and Father John Vesey, a Brooklyn priest who has served in China, would lead the campaign. He also established the Bishop Francis Xavier Ford, M.M., Guild to support the cause for beatification and canonization of the Servant of God with Msgr. 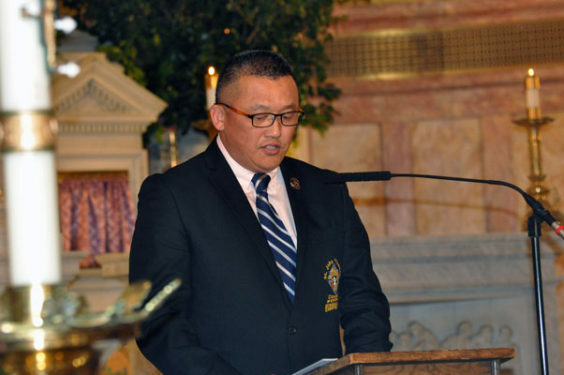 Kevin Noone, pastor of Our Lady of Angels, Bay Ridge, as the spiritual moderator. 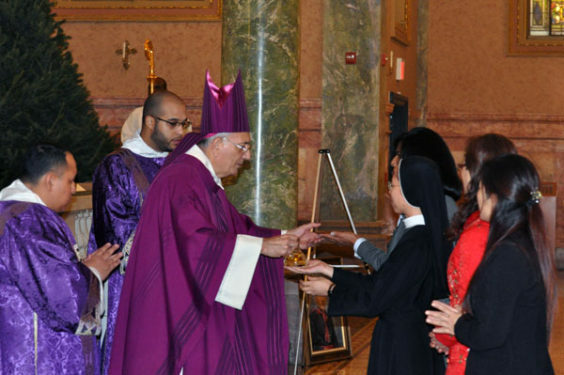 The group’s purpose will be to keep alive the memory of Bishop Ford and to promote devotion and veneration to him. 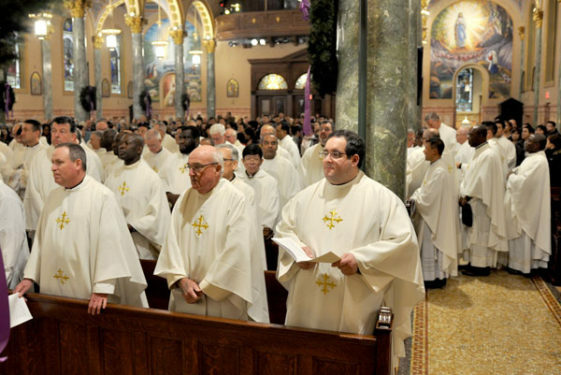 Applications for membership in the Guild can be obtained from the Office of the Vicar General, 310 Prospect Park West, Brooklyn, NY 11215. Bishop Ford was memorialized in a diocesan high school in Park Slope. It was one of five schools built as the results of a very successful capital campaign. It closed several years ago because of rising costs and declining enrollment. 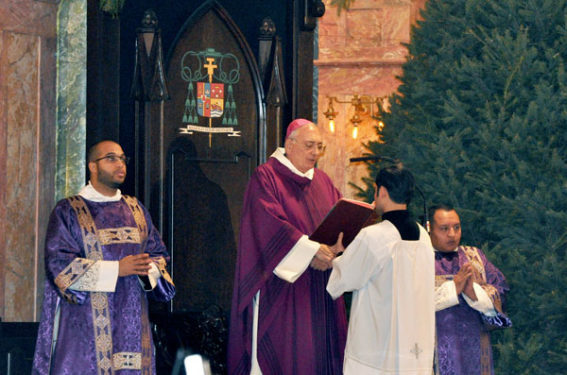 Thanks for running this story on the December 3 Mass at St. Joseph’s Co-Cathedral. It should generate interest in the heroic witness — and cause for beatification — of the martyred Bishop Francis X. Ford, as well as generate applications for membership in the Bishop Francis Xavier Ford, M.M., Guild. My father Raymond Sheridan is incorrectly identified as Vincent in this article unfortunately. Other than that, it was a great article about an extraordinary day celebrating an amazing man. All of our family were in awe while we we there. Thank you for covering the event!